Circa last year, I penned a piece shortly after Notre Dame’s victory over UConn in last year’s Final Four where I wrote that it confirmed that the Huskies are good – not bad – for women’s basketball. The premise of said column essentially boiled down to how UConn’s status as the team to beat and Geno Auriemma’s status as the coach everyone either wants to be or loves to hate proves that there is something to aim for. Auriemma was not too pleased about the unceremonious exit which was sealed by Arike Ogunbowale’s buzzer-beater this past Spring, especially given that his Huskies were on the receiving end of another game-winner via Mississippi State the previous Final Four. So, when these two teams met in South Bend a rematch of last season’s Final Four thriller, one had to think there would be the possibility of bad blood. UConn won the game by a final of 89-71, avenging the Final Four defeat, but what is the hot topic of conversation around watercoolers are the extra curricular activities that took place – including Ogunbowale supposedly shouting expletives at Auriemma. And, supposedly during the post game, there were more words exchanged between Ogunbowale and Auriemma. 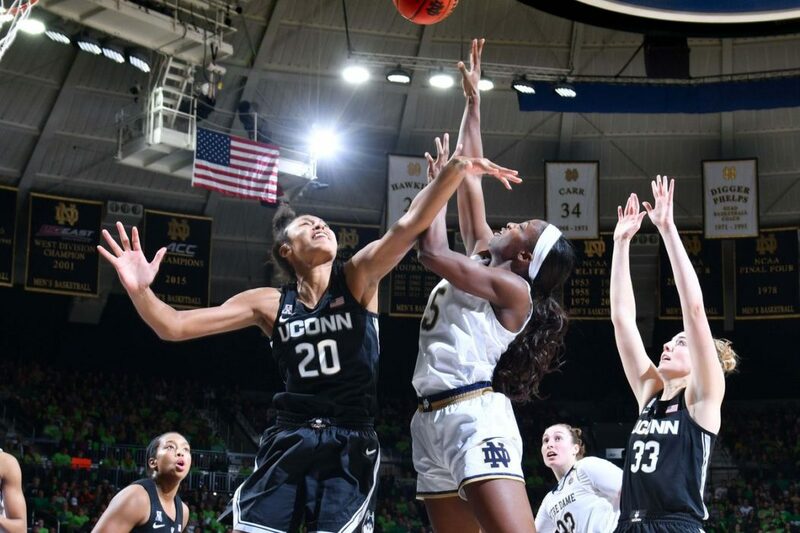 The Irish kept it close with the Huskies before UConn pulled away late – and it may have frustrated Muffet McGraw’s team. The Notre Dame-UConn rivalry is not only playing out on the court, but also on the social media space as well – when another notable Huskies alum screenshotted this. 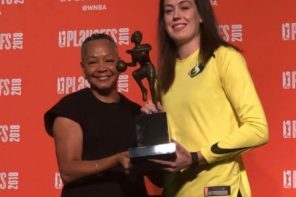 …supposedly blocked Breanna Stewart on Twitter. This appears to be getting interesting. And it further confirms why UConn’s perceived dominance over women’s college basketball is exactly what it needs. If anything, nobody should have apologized for anything. This is competition at its best – or at least it would be portrayed as competition at its finest if it were a men’s sport. But since women’s sports are held to an unfair – and impossible level of decorum they have to follow, we get what we get. Rivalries are a great thing. It is one of the things that makes college sports what it is. Look at Ohio State and Michigan. Look at North Carolina and Duke [our W Podcast co-host Princess Streeter knows a lot about that rivalry being a Tar Heel]. Look at Auburn and Alabama. Look at UConn and Tennessee. Look at Cal and Stanford. Women’s sports does not need to shy away from rivalries. It needs to hug them as tightly as one would hug their loved one on Valentine’s Day. WNBA – we are looking at you too. Not only can bad blood create much-needed animosity between fanbases – it can also create great basketball. When the Los Angeles Sparks and Minnesota Lynx matched up in back-to-back WNBA Finals, that created a simmering rivalry that had the teams, coaches, and even the fanbases looking at each other with sinister glares. 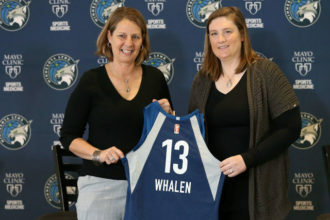 It also created, arguably, the two greatest WNBA Finals in history with both Game 5s coming down to the wire with the Sparks winning in 2016 and the Lynx restoring their odd-year dominance the following season. More rivalries are a good thing. This past season proved that the WNBA is no longer as top-heavy as it was the two seasons the Sparks and Lynx clashed for the championship. And if the WNBA expands to San Francisco, as has been widely rumored the last two years, LA will have a natural geographic rival from the Bay Area. 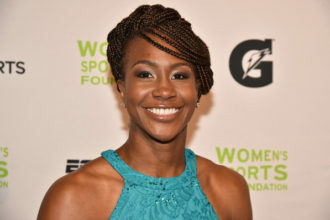 New York Liberty and Connecticut Sun has potential rivalry written all over it. It’s New York’s team and New England’s team not to mention small town vs. big city – it does not get more geographical than that with Uncasville being only a two hour drive from Gotham. 🚨 The first #WNBA game EVER to end on a buzzer-beating 4-point play 🚨… But is @Strick40's game-winner the Play of the Year through one month?? 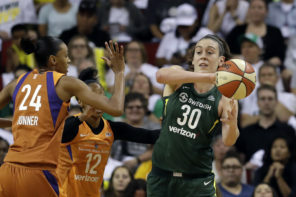 If only the Sun and the Liberty were the two top teams in the WNBA last season – it would make for some interesting ferry rides across the Long Island Sound as well as some interesting train rides on the New Haven Metro-North line. The bottom line is when rivalries are built, it gets people talking about said rivalries and it puts rears in the seats. And social media only adds another dimension to them in addition to tradition and geography. With the Irish and Huskies being the top ranked teams in the country, there is a chance they could meet up again – this time for a national championship. And we will be here for all of it – from the great play to the bad blood to the out and out petty.